We live in a very interesting period of time. I would say that it is an exciting time for the church. I have said this on many occasions because I truly believe that just over the horizon God is about to do something amazing in the Church, and particularly among Friends. I say this because we are living in a period of time, an era of history where the Church is vulnerable. When people are vulnerable our natural instinct is to protect. We often withdraw from the potential dangers and fortify our positions so that we can make a defense when the attack comes. This frequently occurs when there are significant cultural, economic, technological, and natural events causing changes within a community or people group. If we were to remove all political connotations and opinions away from the Syrian refuge issue we would be able to see that this natural instinct to flee danger and protect themselves is at the root of the mass exodus. If we were to just contemplate our own response to the situation if the tables were turned we may even see that we may possibly respond in a very similar manner. And in many cases we are responding in a similar manner, because it is a base instinct that was created within our genetic code. Many leaders across the nation are teaching those that listen that the end is near, that Christ is about to return. I find this form of teaching repugnant because Scripture clearly teaches that no one not even Jesus Christ knows when that great day will occur. When I mention that to people, they often pull back and say just look at the world around us clearly this is the end. No, I believe that it is the beginning of something great (and yes the Lord’s return would be great.). I agree that there are pressures on the church that have been building for decades that are now causing presenting themselves as significant cultural shifts that cause us to look at what has occurred in the past as being the golden age and the future is only darkness. The problem with that type of thinking is that it depends on the perspective. The “golden age” of the church was also seen as the dark ages of culture in Europe. And the church has remained and thrived for centuries after that golden age. It would be foolish for me to say that there is not a crisis of faith occurring throughout our land. It would be foolish to say that our culture has not changed significantly over the generations. Science has shown it to us in multiple ways. I mention science because the scientific method of observation and exploration in search of truth is just one of the ways our culture has shifted. Some of the shifts cause us to step back but other aspects of these shifts can make our testimony even greater. Again it is all about perspective. In many ways the dynamic shift within our culture is similar in degree to the greatest movements within church history. The eighth chapter of the Book of Acts is a testimony of just how important these cultural shifts and the response of the faithful can be to the future of the Kingdom of heaven. The passage today speaks of the people of Samaria becoming believers of the word and being baptized after Phillip teaches them, then Peter and John come to visit and the people are filled with the Holy Spirit and the church grows. This is wonderful but we really need to look deeper to understand just how meaningful this is. Samaria is in many ways the remnant of the Northern Kingdom of Israel. If we look into the history of the people of Israel we would see that after the reign of Solomon the nation split and only the tribes of Judah and Benjamin remained loyal to the house of David, all the others gained their independence, united together and named their own king. Fast forwarding through history the leaders of the Northern kingdom, the tribes that rebelled essentially over the high taxes imposed by the house of Solomon, quickly fell away from God and judgement commenced. When we read about this division we often think that all of the nation was opposed to God but that is not reality. The Levites or the priests still had cities of refuge and centers for worship and faith continued. We do not often hear about the faith of the Samaritans because they opposed the temple of Solomon. They opposed this temple because it was linked to political ideology that they did not agree with. So we see the first division of faith based primarily on nationalism, and nothing about religion. Samaria, we are told fell to the Assyrian Empire, because their leaders opposed God. But there is something interesting about their religion, it still remains. They were a people group that were rebellious and independent and they were free to live as they saw fit, yet through their occupation they still maintained their central place of worship. And just as the people of the southern kingdom they anticipated the coming of the Messiah. Do not hear this incorrectly, I am not saying that the Northern Kingdom was more faithful, it is very clear that many within the northern kingdom opposed God, what I am saying is not all in that kingdom were faithless. Now let us move forward and speak about Phillip. Phillip was a second tier disciple. This is not to say that he was not important because it is very clear from the book of Acts that he was, but what I mean is that he was not one of the original twelve, he was among the second wave of leaders. Philip along with Steven the first martyr, and five others, were appointed to be deacon by the Apostles. This office was created after a dispute emerged between the Jewish and Hellenistic factions of the church over the use of offerings, in short many believed that the Gentile Christians were being treated unfairly by the Hebrew believers. Each of the seven deacons were chosen by the community of disciples, not the Apostles, they were to be upstanding members of high integrity and the apostles laid hands on the seven chosen without prejudice and the seven were to minister to the needs of the Church. Phillip is a man of faith who emerged from the Hellenistic side of the church, he may have come from a Hebrew family but his family by his very name favored the benefits of the Greek culture. If you were a member of the assembly who came from the Hellenistic side of the church would see Phillip as your guy. Well not long after the dispute within the church, the persecutions from the Jewish people in Jerusalem began. One reason for the persecutions was because Gentiles were becoming accepted among the followers of Jesus and the traditional religious community feared it would not be long before the Temple would again be desecrated by these Gentiles. So eventually all the non-Hebrew believers were forced out of Jerusalem. Phillip, a believer with a Hellenistic name, left Jerusalem and went to Samaria, and began to continue the work he had been doing among the people around him. I want to stop there for just a moment because we have two groups of people being discriminated against by the establishment in Jerusalem. The church was at that moment open and welcoming to all people, accepting both Jew and Greek not only in their assembly but in leadership. There was a cultural shift occurring within the religious community, and many felt that this was unacceptable. Does God really intend for people of all cultures to be followers or does He require that all people submit to the hereditary leaders of the promised people. Accepting Greeks that live in and around Jerusalem is one thing, they lived there, now they hear that there are people in Samaria that have become followers? I want us to consider this from a different perspective for a moment. Phillip is a member and leader within our Meeting and because of financial reason he is forced to move from our community to work in another nation. It just so happens that the only place he can find work is in the lands occupied by a group we oppose. Let’s just say he was hired by a company that required him to move to Iraq because he is a petroleum engineer and they needed him to work on a new project. Well Phillip is a well-respected member of our Meeting and we will greatly miss him and his family. After a few weeks we get an email saying that he was worshiping among a group of people in Iraq. He sounds very excited about it and goes on and on about the amazing life changing occurrences that are happening while he works among the people of that nation. He then adds even ISIS Militants are coming to faith and are going to start an Evangelical Friends Church with him. We were with him up till then. ISIS is an enemy they cannot be accepted. Why? This scenario is fictional, but is similar to the situation Phillip had in Samaria. Samaria was the enemy of Judah. They are the enemy of God. They oppose coming to the Temple in the capital city to make sacrifices and leave offerings to provide assistance to the people of the nation. At this moment the Church has a huge problem does God love the people of Samaria and can they be Samaritans and Christian? The church of Jerusalem quickly met to discuss this unprecedented event, and it is decided that Peter and John will go to meet with Phillip and the Samaritans. They send them because by Luke’s writing we see that they are baptized but do not have the Baptism of the Holy Spirit. And Peter and John want to know and pray with them to see if they can be accepted into the Church. Notice that I said accepted into the Church. The reason I say this is because there is a phenomenon occurring. After Pentecost God did not withhold the baptism of the Spirit from believers, even the Gentiles were filled with the Holy Spirit. As they drew close to Christ it became apparent that they were authentic not only in word but in their actions. But there is hesitation when it comes to Samaria. Is God withholding his blessing from those dogs for the long history of rejection of the true faith or is something else going on? I do not want to get into a debate over what it means to have the baptism of the Spirit. We in the Friends Church are very liberal in this area, it can mean many things but it can always be summed up into one statement: It will be evident in our lives that we are true believers. I want us to consider is what God is doing in the Church at this moment. Peter and John go. Peter the outspoken person and obvious leader, and John the one whom Jesus loved. Both were members of the Apostolic ranks, both were in the inner circle, the closest of Jesus’ friends. Peter was the one who witnessed the vision and evidence of God’s acceptance of Gentiles into the church but it is very clear that at moments Peter falls back into a very Law focused expression of faith. John is probably the most accepting of outsiders, because of this he almost comes across as being opposed to his own people in his writings. These two were chosen to represent the church as they consider the people of Samaria. They go because they do not trust Phillip, they do not trust that these Samaritans could be believers if there was no evidence of the Holy Spirit being present. But I ask a simple question: Who was the Spirit hidden from? Phillip obviously saw something because he was reporting that they were believers. But the apostles in Jerusalem were not convinced. Could it be that even the Saintly Apostles, the first disciples of Jesus, the ones that walked in the very dust behind the greatest teacher and Messiah, could have been blinded by their own flesh? Could it be that they could not see the truth of the Samaritan faith because they were too wrapped up in their own nationalistic religion? I only mention this because Phillip does not have an issue with the ministry that he has among the people, but the Apostles. I do not mean to cast shame or doubt on the heroes of my faith, I only wish to get a glimpse of the truth. Peter and John go. They do understand that God might be working a great thing among their Samaritan neighbors. They go and they meet with them, they speak with them, they lay hands upon them, and pray with them. The result of this is Samaria is accepted into the Church, the blinders have been removed and all can see that God is at work. There are some lessons we can learn from this short passage, the first is that if we question we should seek to find the answers. And the second is we need each other to become fully aware of the truth surrounding us. This is the great Epiphany of this season, the great revaluation and insight from God. That he is working in ways we do not fully understand among people we do fully know. And he is calling us to meet with them, to speak with them, to encourage them, lay hands of on them and pray with them. He is calling us to know and get to know all people from all over and let them know the Word of God. The Word that they are loved and accepted, they are forgiven and redeemed, they are restored and glorified through the birth, life, death and resurrection of our Lord and God, Jesus. As we enter into this time of open worship. Let us reflect on the ministry of Phillip to the people seen as enemies of Israel and God, let us consider our own changing culture and vulnerability that it causes within our church, but let us also consider the great hope and insight that we have received from Jesus. We have a future and a reason to be here. And it is so we can encourage others along their journey with Christ. It is on days like today that it is hard to be true to the faith that I profess. On days like today I, with the rest of the world cry out to God wondering why awful things happen. Days like today I want to walk down to the nearest recruiting station and sign up to join a fight, I want to teach someone some sort of lesson and rid the world of all the wrong. To see and hear about bombings and shootings in Lebanon, France, and Iraq rips my heart out. To look at the world and realize that it could be very soon that we see the next war to end all wars. I find it odd that that term was one that was used for a war that was fought one hundred years ago. A war and the men and women, the families that were dramatically affected are remembered every year on the eleventh of November. We call it Veteran’s day but it began as a day to remember the ending of the First World War. Yet as we remember the true cost of war the horrors of violence continue to play out before our eyes. This past week we remembered the cost of war, and this week we remember that war remains. This is a cycle that continues throughout history. A cycle of power hungry people seeking to bend others to their wills. A cycle of history that continuously repeats because so often we are controlled by pride, greed, and lusts failing to open our eyes to the humanity of those around us. Instead we see only means to an end, enemies to conquer, potential profit centers, and political supporters. We claim to remember the cost of war, we give platitudes of peace but do we really seek it? The letter to the Hebrews was written just prior to possibly the most devastating event of Jewish history. It was written just prior to the final bout of the Jewish War. This war was not just a war that was fought in a forgotten corner of the Roman Empire but it was a war that shook the world. Many scholars have connected the battle in Palestine with the removal of Roman forces from Britain. This war changed the very courses of history yet many even remember it happened. It was a war that was fought for independence, religious freedom, nationalism, and cultural identity. It was a war waged by humanity in the name of God, and the result of this war sent the people that followed the God of Abraham into a cultural tailspin. It destroyed the temple and with it disconnected the people from the mercy of God. 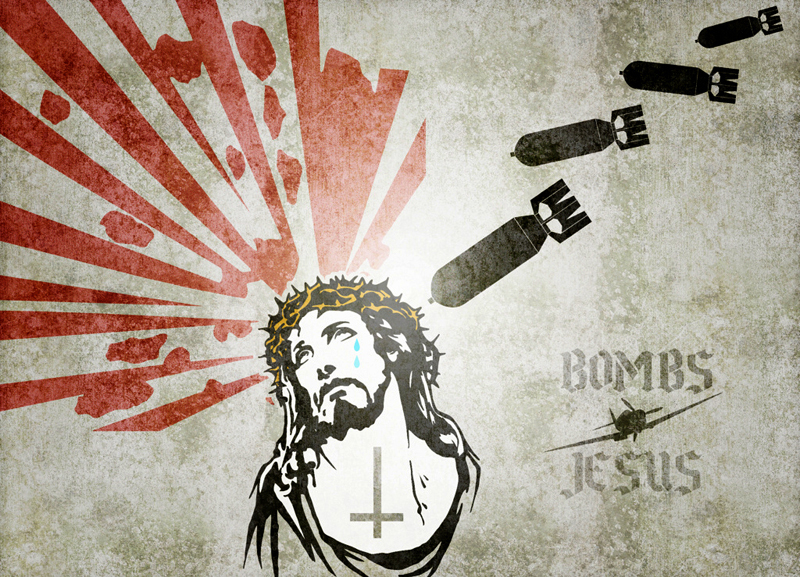 War is not of God. Wars are fought because of humanities inability to live at peace. Wars are fought because of petty jealousies and contempt have gotten out of hand. They begin not with nations but with individuals. Cain was jealous of Abel so Cain removed the one that cause his discomfort. Cain, according to scripture, went on to develop the first city, the first civilization, the first empire, and violence was used to protect his legacy. At the dawn of this war that ripped the Jewish people from the land of promise, a new era was beginning to emerge. An era that began with a rabbi that walked among the disenfranchised people that were forgotten by those in the seats of power. It began because a rabbi began to change the focus of the teachings of the prophets and the law to focus on the people instead of the nation. This rabbi questioned the status quo, began to personalize the religious practices, and caused people to consider the heart of the law instead of the letter. This teacher introduced people to a God that cared for them. This was not anything new really. It had been taught throughout the ages, it was taught by the prophets of old prior to the exile of Judah. It was taught by the great law giver Moses. Yet people were distracted. Their minds were focused on things around them instead of God, they were focused on their own selfish gains instead of the humanity of those that lived next door. The writer of Hebrews remembers the prophet Jerimiah and he quotes, “I will put the law in their hearts and I will write them on their minds.” This new era that was ushered in by Jesus, the era we call the new covenant, is one that is based on relationship instead of sacrifice. It is an era where we can each be directly connected with the Spirit of God and not have to rely on a priest to intercede for us apart from God himself. Consider this quote for a moment. What does it really mean to have the law in our hearts and written on our minds? To have the law in our hearts goes well beyond knowing scripture. It is becoming the embodiment of scripture to the world around us. Living the scripture out to the fullest extent, taking it to heart means that it becomes the very essence of who we are. If we were to take the law “do not steal” to heart let that become the very essence of who we are as a person, what changes? The very idea of theft sickens us, the possibility of potentially taking what is not ours and defrauding someone of their own possessions becomes unthinkable. If we were to live by this concept every aspect of our lives would be moved from our own personal gains and entitlement and would focus instead of mutual benefit. The heart of the law condemning theft is building relationships, respecting others, and mutual profit. Think about the other laws, do not commit adultery, do not kill, do not bear false witness, each if they are taken to heart, if they are lived instead of followed takes us to a completely different place. Respecting the individual instead of considering them a means to an end, honoring others by seeking truth instead of building ourselves up on falsehoods. Recognizing that every individual no matter who they are or what they believe should live and we should honor and protect their lives. Do we allow God to place the law into our hearts? Are we allowing His Spirit to saturate our being to the point that His ways become the very essence of who we are? This is why my heart grieves today. I grieve because I can see in my own life that I have failed in so many ways to take the laws of God to heart. I grieve because somewhere along the line the people that are claiming Christ have failed to provoke one another to love and good deeds. And if the people that have encouraged me to come to faith can fail, where does that leave me? Martin Luther King, Jr. said “Darkness cannot drive out darkness; only light can do that. Hate cannot drive out hate; only love can do that.” As a leader of a group of people that were mistreated and often hated for no other reason than the color of their skin they had every right within the laws of man to rise up and fight against the oppression. But they instead took a different approach. I did not live through that era in history. I know that that time was not filled with peace I know that it was not an easy path for any that lived through that period of history but I also know that it made a difference. It can be summed up in a simple statement, “we cannot give what we do not have.” Hate breeds hate, violence breed violence, war breeds war just as hope breeds hope, respect breeds respect, encouragement breeds encouragement. Provoke one another to love and good deeds. The writer of Hebrews is saying the same thing as Martin Luther King. The only way to change the course of history is to stop or change the cycle you are perpetuating. We need to actively pursue the very things we are hoping for in Christ. We need to become the embodiment of the law. Have it become the essence of who we are and what we hope for. Actively pursue without neglect, it cannot be passive but can only be lived. Today we each face a challenge. It is a challenge that we have faced many times before at many different junctions on our pathway through life. Will we provoke those around us to love or will we continue the cycle of hate. Will we recognize the humanity of those around us or will we live life pointing fingers at others that have slighted our egos? Will we be instruments of war or peace? I do not care about converting people to an institution of religion. I do not care about changing people’s political stances. But I care about people, I care about life, I care about the future that my children will inherit and the children of those around me. Will it be a world one step closer to the kingdom of Christ? Will it be a world that is willing to forgive and reconcile or will it be a world that holds onto the sins against them? Will we as a church provoke love and good deeds, will we encourage each other closer to God through Christ, or will we teach the ways of the world? As we enter this time of open worship and communion as friends. Consider again what it means to have the law written in our hearts and on our minds. Consider what that means today and what it means as we train up the next generation. Consider. Will we as individuals, and as a community become people of God? A people who are loving God, embracing his Holy Spirit and living the love of Christ with others? Consider just what that might mean and are we willing to sacrifice our lives to allow that type of kingdom to come on earth as it is in heaven?